The 2018 will place at Unit 43 Waterford Business Park, Cork Road from Friday 26th – Wednesday 31st October. 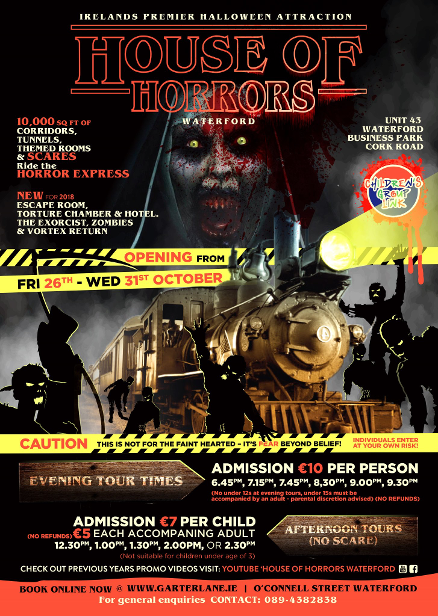 The event will feature exciting new editions, new scary faces and frights galore! . The House of Horrors is mainly volunteer driven. Our young members are a key part of the success of this event and they have turned out in their droves to support us this year. We are so grateful for their participation. As important, is that fact that they are surrounded by caring adult mentors, both staff and volunteers, that guide them through every step of the way. Such relationships are critical to a young person's development. We have some great photos below of what has been happening so far this year. Enjoy...and see you there! Book online at here at Garter Lane. A total of 4,436 visitors attended the House of Horrors in 2017 and we expect this year will be even better.